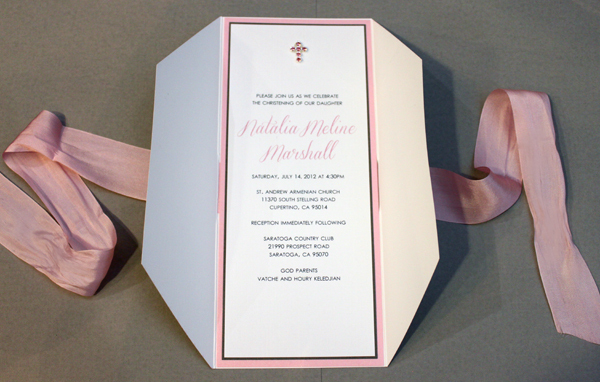 My good friends Aline and Dan asked me to design their daughter Natalia's christening invitations. Since this was going to be a grand affair, Aline wanted something that looked more formal with a little bit of bling. I found these beautiful pink swarovski crosses that became the inspiration for the rest of the design. I loved how they turned out and so did Aline. She said "you definitely can't find anything like this online!". That is precisely why I started custom designing invitations, I could never find an invitation that I fell in love with or matched the theme I was going for. I like the invitation design to act as a sneak peak of what's to come at the event. Aline and Dan, Natalia is absolutely precious. May god always bless your beautiful family. 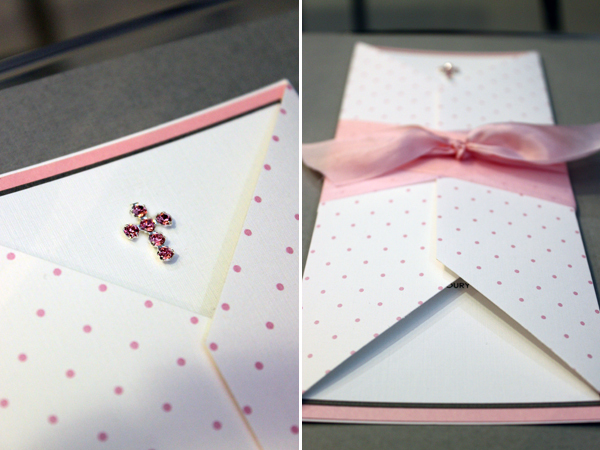 The Design: The invitation was attached to the inside of a pink polkadot linen textured gate fold. 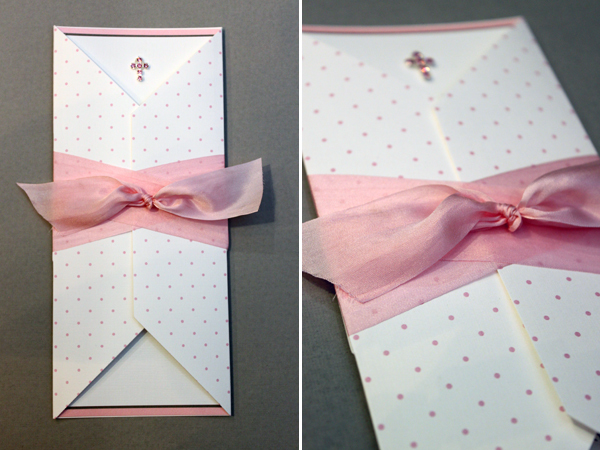 The gate fold was wrapped with a soft pink silk ribbon. The inside had three layers, first a pink metallic card stock, then a matte grey card stock, and lastly the invitation on top. 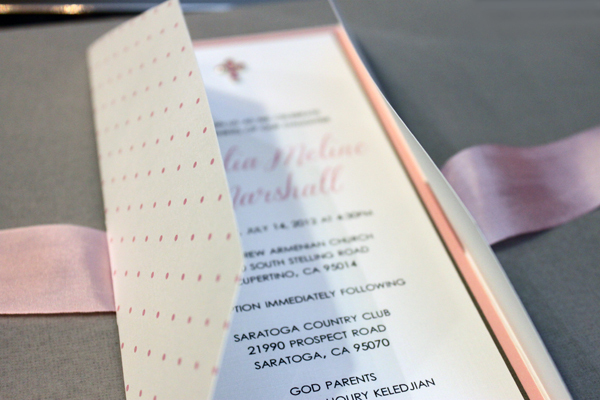 I added a pink swarovski crystal cross to the top of the invitation so that it was visible from the outside of the gatefold. 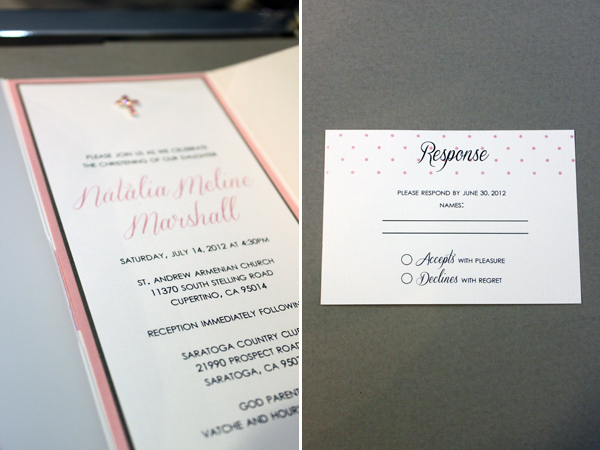 Since there were many guests invited, I also designed a response postcard to make collecting the RSVP's easier. 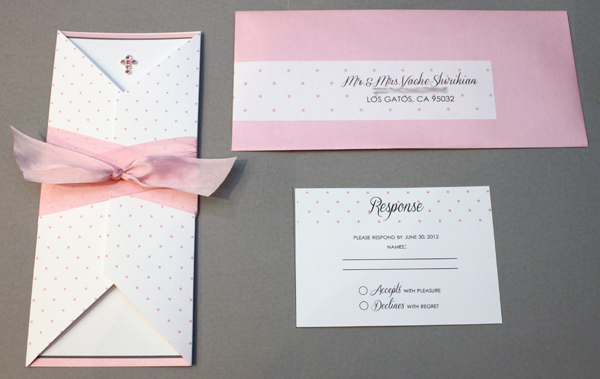 The invitation was inserted into a pink metallic envelope and a matching address label was wrapped around the side.